The following items may be picked up at the registration desk located in the convention hotel at the time you arrive. A convention badge (you will need this to gain admittance to the convention events and layouts). Individual registration applies to a single person. Family registration applies to your immediate family (up to four). Notice that early registration will include a discount of the regular price of the convention. Early registration will end on 1 June 2019. Participation in an Operating Session (one of four) where you run a train yourself, picking up and delivering cargo cars at various locations around the layout using waybills, with a dispatcher coordinating the train movements: Free participation, but limited attendance. Participation in a Family Day Operation Session. In this session, you just run trains. There will be no waybills or dispatcher. Just have fun running the trains: Free participation, but limited attendance. The 2019 Convention car is a USA Trains 1:29 Union Pacific center beam flat car with 12 removable double-sided lumber loads. Loads have the convention logo on one side and RSG Forest Products, Inc. on the other so the car can either be a convention car or a prototype UP car with lumber loads from RSG Forest Products, Inc. 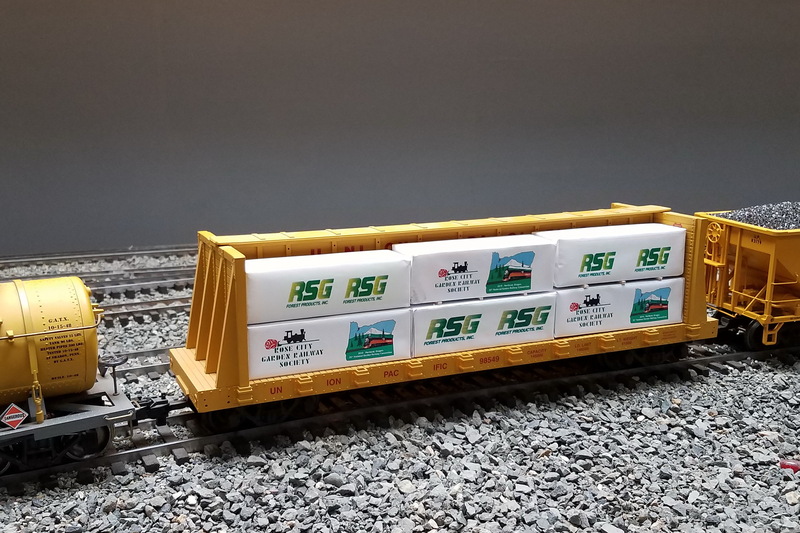 These loads have been manufactured by the Rose City Garden Railway Society for this convention. Here's some views of the actual center beam flat cars loaded with RSG loads and waiting for pickup in Canby (just a few miles south of Portland, OR) for the Union Pacific main line. To register, click here for an "Individual" registration, or here for a "Family" registration. To pay on-line, click the "Pay on-line" button on the registration confirmation page. Accepted credit cards include Visa, MasterCard, American Express, and Discover. By using the "Invoice Me" button on the registration confirmation page, you will get an eMail with the invoice. Simply send in a check made payable to the "2019 NGRC". Please include a copy of the invoice, or at least the invoice number, to ensure your payment is properly accounted. To make inquires regarding registering for the convention, or to make any changes to your registration, please send an email to the 2019 NGRC Registrar. The email address is: 2019NGRCregistrar@rcgrs.com.